Owl’s Dream, by Valentina Atton and Sophia Johnson. 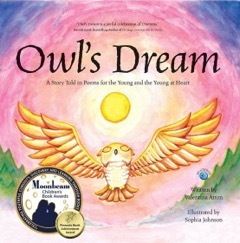 Written and produced on neighbouring Pender Island, Owl’s Dream is a book of poetry written by Valentina Atton and illustrated by Sophia Johnson. Introduced by Owl, each poem represents a different animal that meets a child. Together, text and illustrations take a young child on a journey through nature. The child meets a fawn, a dragonfly, a lamb and many other animals, both local and foreign, wild and domestic. They all talk to the child, expressing love and encouragement. The poems will be fun to read aloud with a toddler and a parent or educator can use the illustrations for more discussion on how we treat animals, nature and each other. I bought my copy of this book at Watermark Gallery on Salt Spring Island.